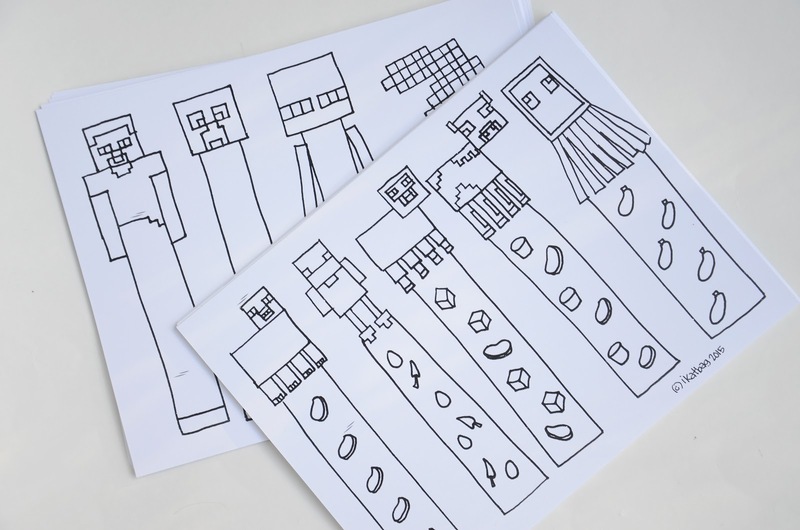 These are the various paper printable elements of Kate's Minecraft party. If I got anything right at all, it is because the children vigorously tutored me in their rendering. The objects below the animals are apparently what those animals "drop" in the game for players to retrieve. Why exactly this is important completely escapes me. 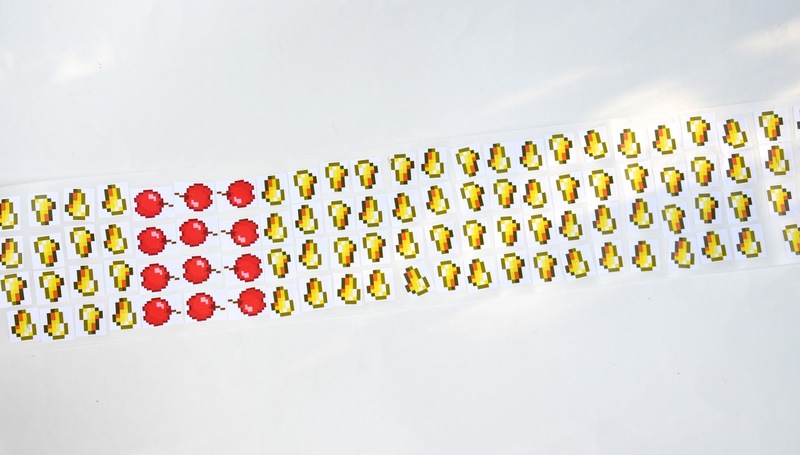 Click HERE to download the bookmark sheets. 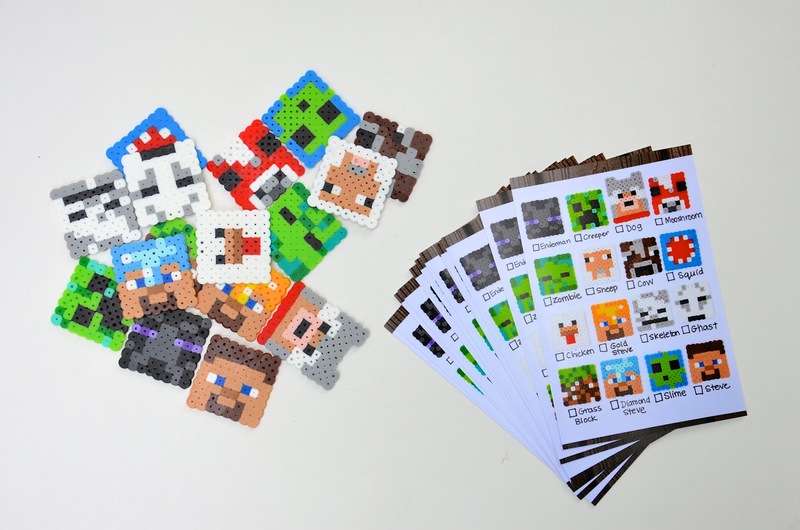 Very easy to set up - just take photos of the Heads on a white background with individual labels under each Head, and print one for each player. 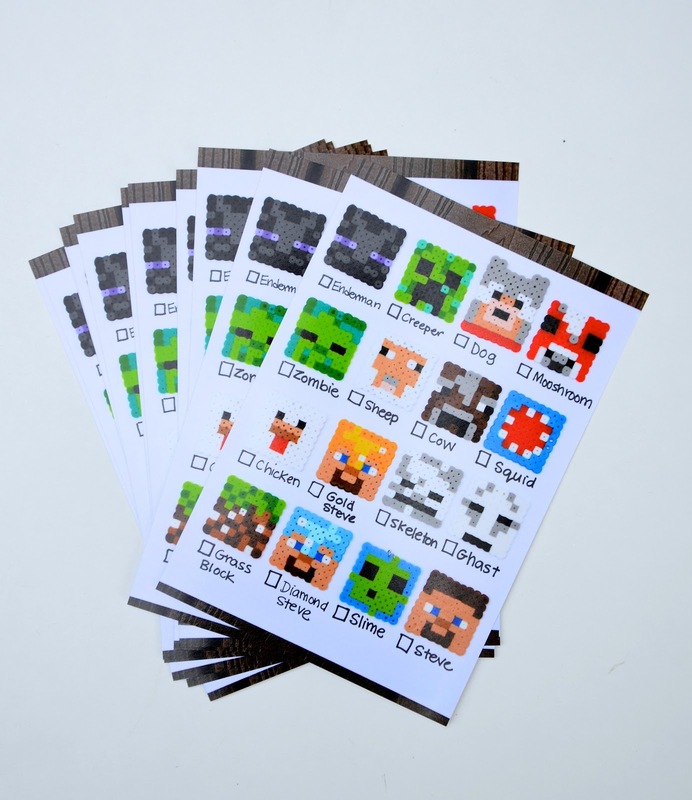 Then hide the Heads and give each player a checklist card and send them off to find them. 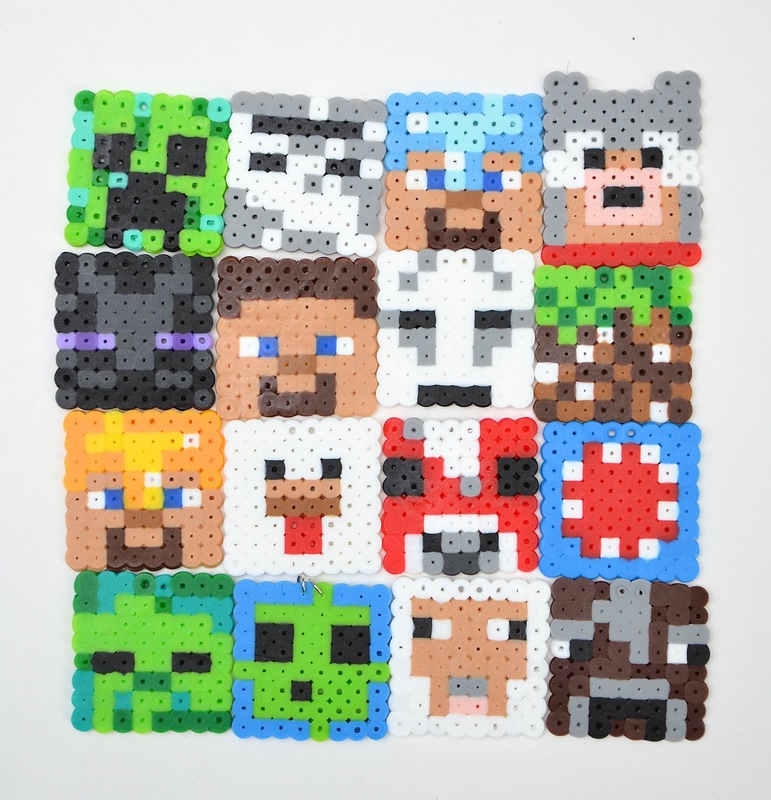 Supply prizes for everyone who finds all the Heads. 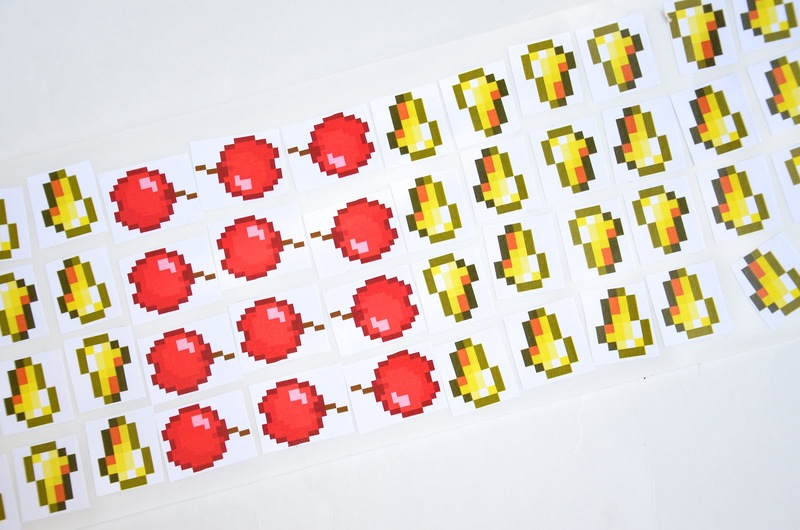 The Golden Apple crafting table activity, unlike the bookmarks and scavenger hunt, is actually representative of real Minecraft goings-on. 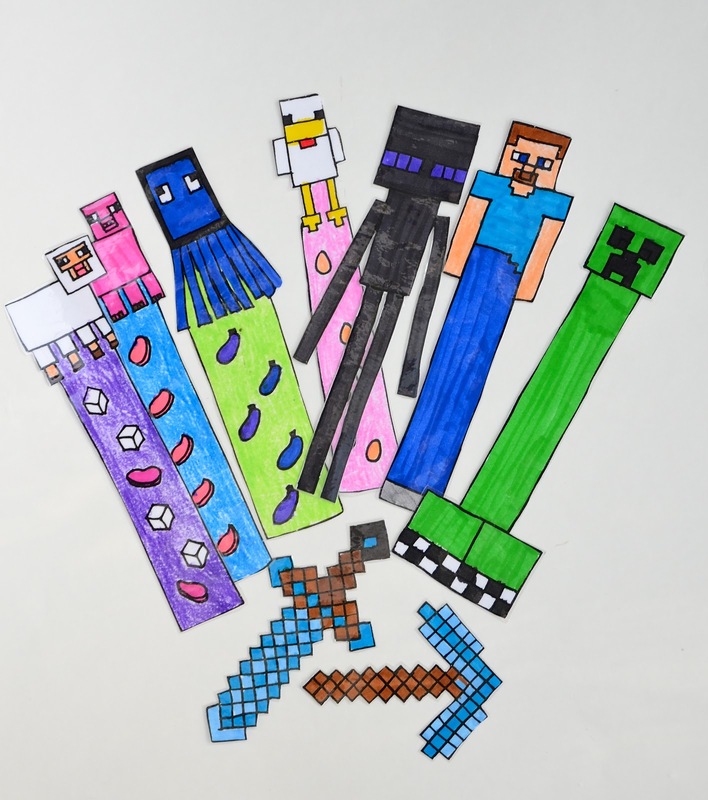 By that, I mean that the guests all recognized this as a bona fide Minecraft event, whereas they stared blankly when we informed them they would be coloring bookmarks and searching for Square Heads. 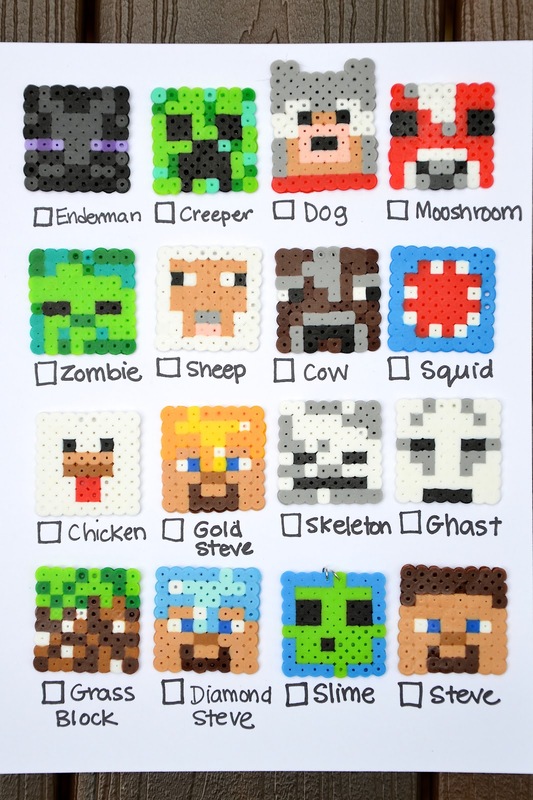 Apparently, there are no disembodied heads in the Minecraft universe and everyone there is too busy building and fighting monsters to actual sit down to color anything. 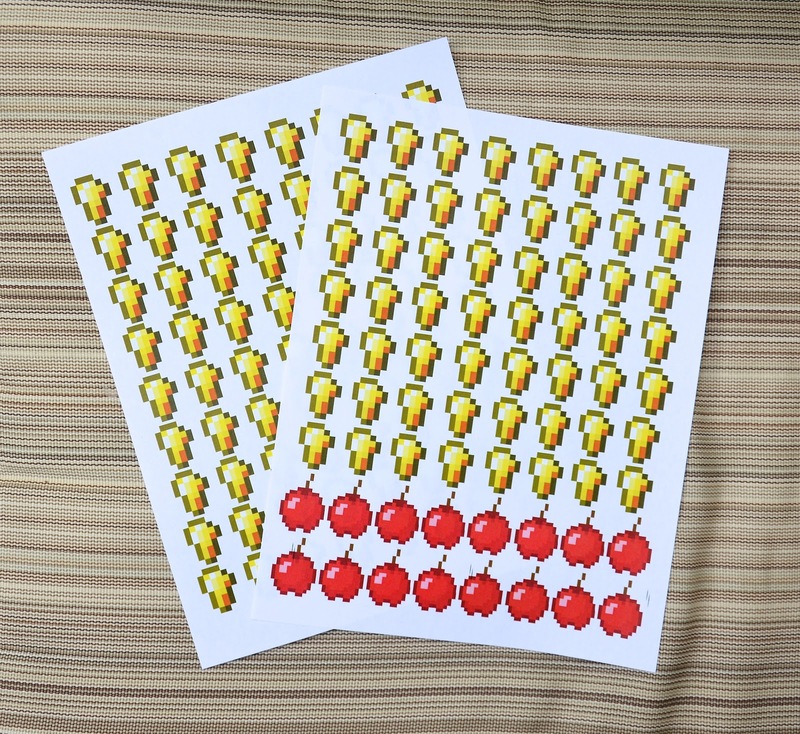 and turned them into stickers with our sticker maker. We made enough for each guest to have 8 golden nuggets and 1 red apple. 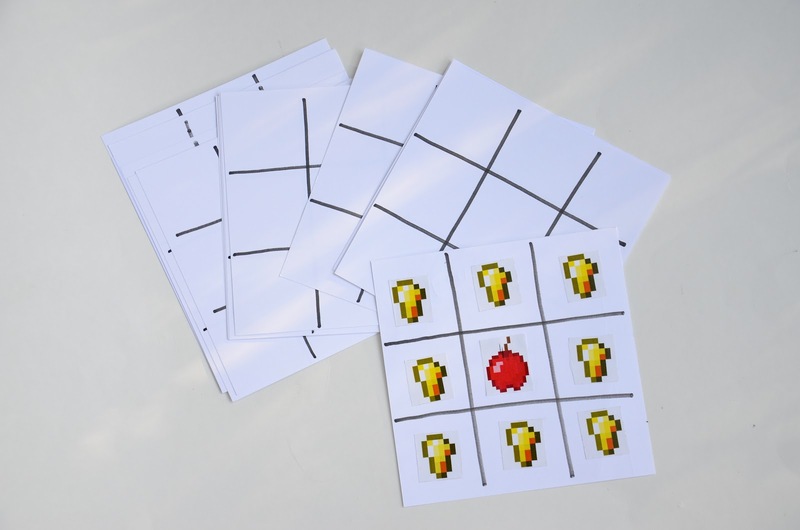 Then we made square cards like tic-tac-toe boards, which are symbols of the Crafting Table. 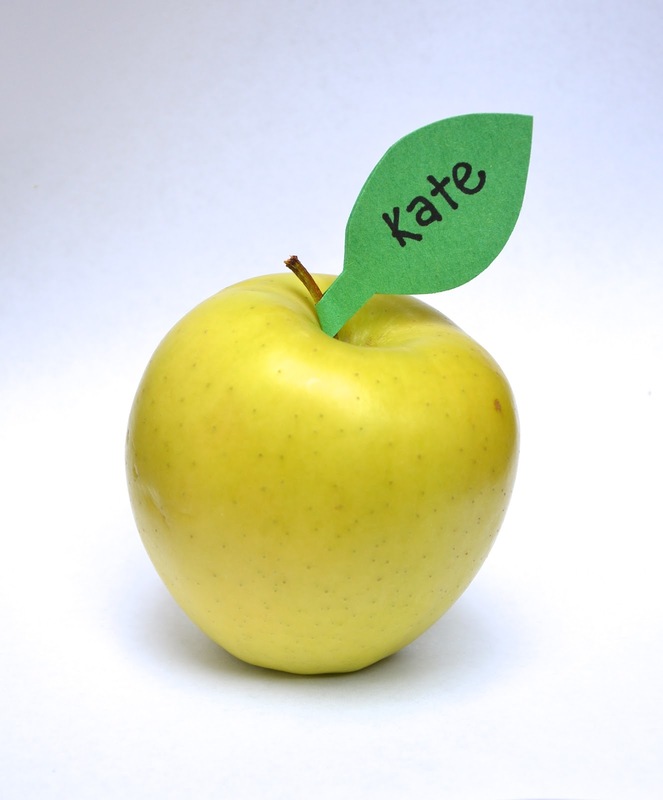 The completed sample shows the "recipe" to create a Golden Apple. Our golden apples are golden delicious apples from the supermarket. 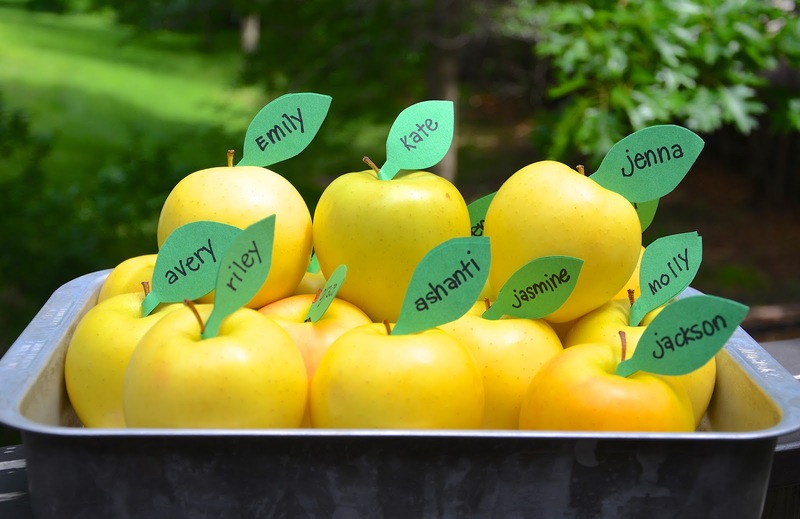 On the day itself, all the kids had to do was stick the stickers in the correct configuration and turn in their card in exchange for an apple. Easy. Kid: You mean "Crafting Tables". Me: Yes, Crafting Tables. 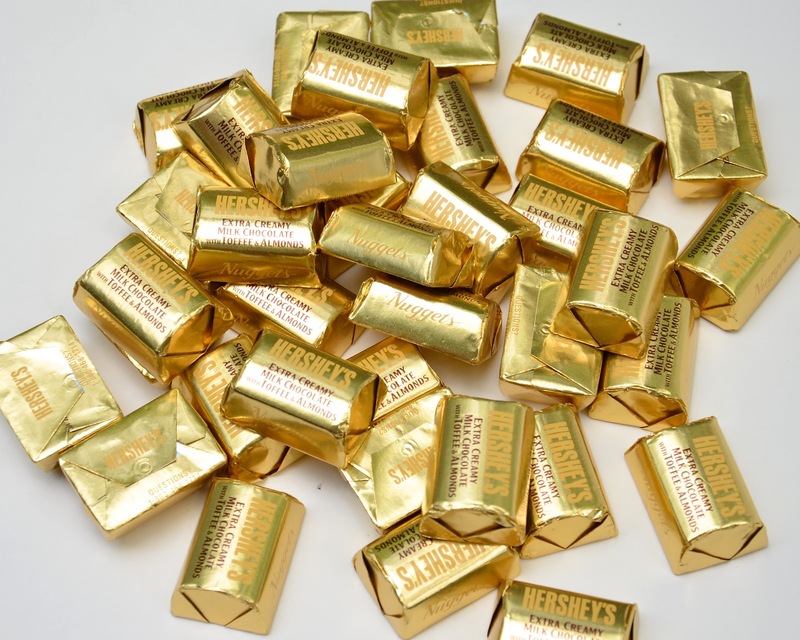 When they complete them, they get a golden delicious. Just like the game! Fun, right? Other Kid: But will there be a hole in the middle? Other Kid: Where will the Golden Apple appear? Me (completely baffled): Appear? Grandma's going to give it to them. Other Kid: But there must be a hole in the middle of the Crafting Table so the Golden Apple can pop out! Other-Other-Kid (somewhat patronizingly): In Minecraft, Mom, the Golden Apple just appears when you have all the ingredients in place. Me: THIS IS A BACKYARD PARTY! IT IS NOT THE COMPUTER! Nnnngrrhhhrhrhrr. So anyway, just to make it clear, we bought, with our credit card, an apple for each kid from the supermarket and put them in a physical container and the kids' physical human grandmother physically received each stickered paper card from each child and put it aside and then physically removed an apple from the physical container and handed it to the child who then closed his/her fingers around it and took it away. I read the last part three times, howling with laughter each time! You are so awesome sauce! I also laughed hilariously at the golden apple exchange. It reminds me of a similar incredulous conversation I had with someone younger about the concept of a film camera... Anyway, though, just think of what these kids will design when they are older when they have grown up with 'golden apples appearing through the table' as an expected thing. It's going to be so cool! Taking a break from work and decided to check your party updates. This is totally hilarious - just can't stop laughing!